Something old, something new, something borrowed, something brewed? We love this idea! A coffee bar is another way to serve your hot beverages at a wedding, but the self serve option can also be styled like this. A coffee bar can be set up after the wedding ceremony, so that your guests can warm up before the reception - or get a kick of caffeine before dancing the night away! The coffee bar can also be set up at the end of the reception with dessert or as a late pick-me-up drink. If you're having a day wedding, even better! A coffee bar can take the place of alcoholic drinks and served at brunch. If you have a favourite coffee shop, ask them if you can hire their services with a barista for your wedding - what a unique touch to add to your wedding! 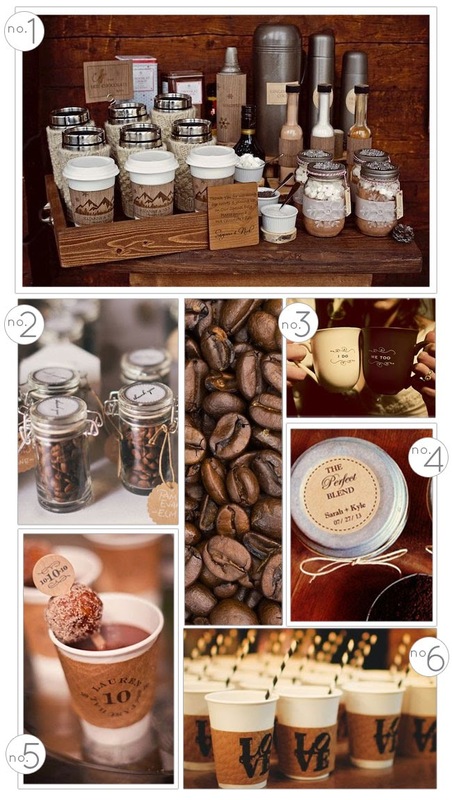 There are so many ways that you can make this unique to your own wedding as well, with custom made coffee sleeves and much more, as you can see from our inspiration board below.